Recent Posts | Superprincipia's Blog | Physics of the Future Today! In this Part #3, the “Super Principle Relativity Theory” uses various “Hydrodynamic Field ─ Vacuum Energy Density ─ Frames of Reference”, which are differentiated by the symbol (ψ); to distinguish between: gravitational, electromagnetic, isotropic space-time world line, gravitational sink, gravitational source, electromagnetic sink, and electromagnetic source frames of reference. The “Hydrodynamic Field ─ Frame of Reference” is described mathematically by the Euler-Lagrangian “Hydrodynamic Field Vacuum Energy Density” Gravitation equation. Also, the “Hydrodynamic Field ─ Frame of Reference” is described mathematically by the Einstein – General Relativity Theory “Hydrodynamic Field Vacuum Energy Density” Gravitation equation. The Super Principle Relativity Theory is a hydrodynamic field theory, which models “Gravitation” and the “Vacuum”, in the conceptual and mathematical framework of a variable density compressible ideal gaseous fluid. In contrast to General Relativity Theory which is a field theory, that models “Gravitation” and the “Vacuum”, in the conceptual and mathematical framework of a fixed density “frictionless incompressible fluid medium” or “incompressible liquid medium”. This Part #2 sets to prove the compatibility of Super Principle Relativity Theory – Hydrodynamic Gravitation Field theory, with the currently accepted General Relativity Theory – Gravitation Field Theory. This is accomplished by using the mathematical framework established in Part #1, and deriving a Ricci Curvature that is time-like. 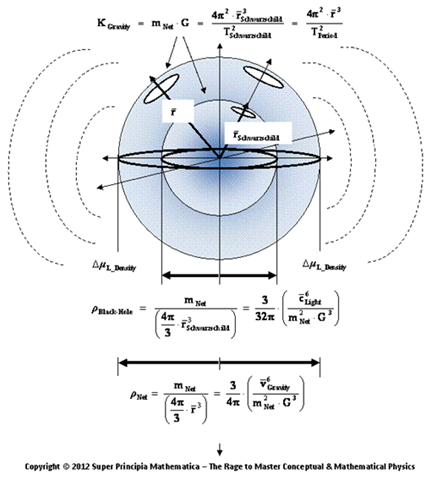 And deriving the well-established Einstein styled Gravitational Field Equations. The Super Principle Relativity Theory is a hydrodynamic field theory, which models “Gravitation” and the “Vacuum”, in the conceptual and mathematical framework of a variable density compressible ideal gaseous fluid. In contrast to General Relativity Theory which is a field theory, that models “Gravitation” and the “Vacuum”, in the conceptual and mathematical framework of a fixed density “frictionless incompressible fluid medium” or “incompressible liquid medium”. The new theory produces exact solutions to gravitation phenomena, and describes the Euler-Lagrangian Hydrodynamic Energy Density Equation, as a space-time frame of reference; and is mathematically the net sum of space-like and time-like energy density terms. The “Hydrodynamic Field Energy Density Frame of Reference” is used to model the interaction between seven (7) physical phenomena: gravitational, electromagnetic, isotropic space-time world line, gravitational sink, gravitational source, electromagnetic sink, and electromagnetic source energy density frames of reference. The “Hydrodynamic Field Theory” models physical phenomena: solar systems, galaxy rotation, quantum mechanical systems, etc. 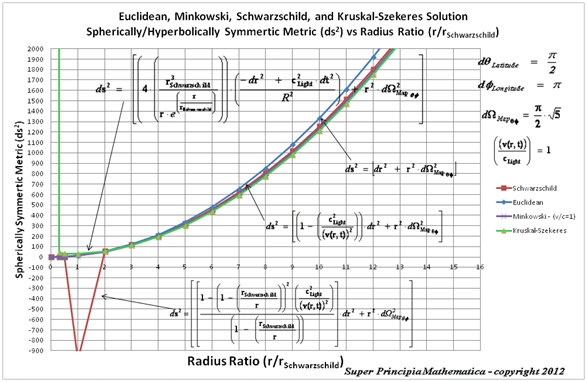 This paper is a mathematical treatise and historical perspective of Karl Schwarzschild’s original 1916 solution and description of a Non-Euclidean Spherically Symmetric Metric equation. In the modern literature of the Schwarzschild Metric equation, it is described as predicting an output of a “Coordinate Singularity” anomaly located at the surface of the Black Hole Event Horizon. However, in Schwarzschild’s original 1916 metric solution there is not a “Coordinate Singularity” located at the Black Hole Event Horizon, but there is an actual quantitative value for space and time, that is predicted there. 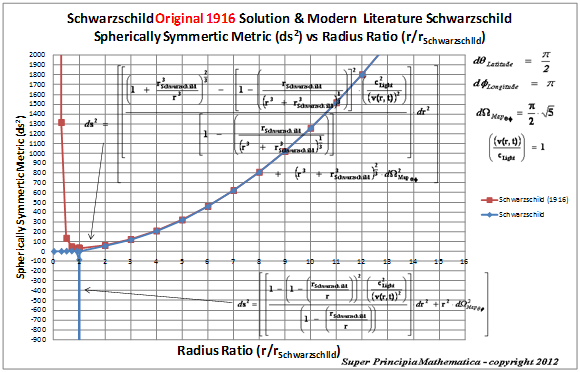 This paper and work compares the Schwarzschild Spherically Symmetric Metric equation original 1916 results with the results predicted by the modern literature on the Schwarzschild Metric. This work also describes conceptually the physics behind the Gaussian Distance Curvature and Reduction Density equation that Schwarzschild used to eliminate and avoid a “Coordinate Singularity”. This work reveals that Schwarzschild’s original 1916 solution, predicts that the Inertial Mass Volume Density, Escape Velocity, and gravitational field acceleration is reduced at all points in the inhomogeneous gradient gravitational field. This reduced Schwarzschild Gaussian density also reduces the gravitational tangential velocity, and acceleration in the inhomogeneous gradient gravitational field. This work is written to physicists with the aim of pointing out the fact that the “Modern Literature” claims conceptually and mathematically, that the Spherically Symmetric Metric Schwarzschild Metric produces two singularities, one “Physical Singularity” located at the center of the system, and a second “Coordinate Singularity” located at the Black Hole Event Horizon, located at the Schwarzschild Semi-Major Radius, of an inhomogeneous gradient gravitational field. However, in Karl Schwarzschild’s original 1916 paper, he predicts conceptually and mathematically, that the Spherically Symmetric Metric Schwarzschild Metric produces one singularity, the “Physical Singularity” located at the center of the system. In Karl Schwarzschild’s original 1916 paper, he does not predict a second “Coordinate Singularity” located at the Black Hole Event Horizon, like the “Modern Literature” and the physics community claims! Karl Schwarzschild’s original 1916 paper : “About the gravitational field of a mass point according to Einstein’s theory”. The original 1916, Spherically Symmetric Metric Schwarzschild Metric equation produces, one “Physical Singularity” located at the center of the system; and Schwarzschild avoids or eliminates “Coordinate Singularity” located at the Black Hole Event Horizon, located at the Schwarzschild Semi-Major Radius ( ), of an inhomogeneous gradient gravitational field, by using a Gaussian Curvature ( ) Distance Radius. The mainstream physics community at large currently teaches that there is no solution to the “Coordinate Singularity” anomaly located at the Black Hole Event Horizon; and they do not appear to be searching for a solution! The mainstream physics community seems to be content, accepting the fact that, space and time, become unpredictable at the Black Hole Event Horizon. While they fantasize that “Electromagnetic Radiation “Light” cannot escape a Black Hole Event Horizon”. Once again, this fantasy concept that space and time become unpredictable at the Black Hole Event Horizon is not a result of the original solution or prediction, made by the inventor of the metric, Karl Schwarzschild which he published in 1916. Published in Schwarzschild’s original 1916 solution, there is not a “Coordinate Singularity” located at the Black Hole Event Horizon, but there is an actual quantitative value for space and time, that is predicted there. 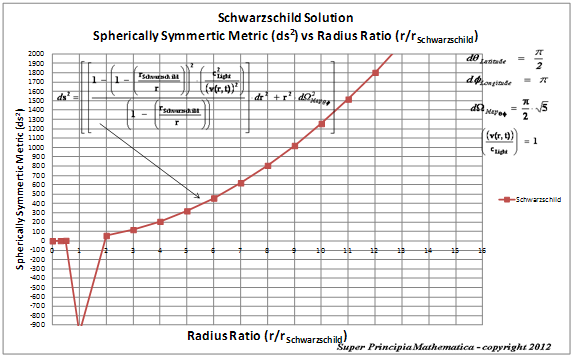 This paper and work compares the Schwarzschild Spherically Symmetric Metric equation original 1916 results with the results predicted by the modern literature on the Schwarzschild Metric. This work proves that eliminating the “Coordinate Singularity” allows for smooth prediction of a “maximally extended” space-time in the form of a “geodesic” world “line element” ( ), as a real curving or warping of physical space, space-time, or a gradient gravitational field, that is spherically symmetric, surrounding a condensed matter, mass ( ), or energy source, even at the Black Hole Event Horizon. The Schwarzschild original 1916, metric equation and coordinates are chosen because they cover the entire maximally extended Riemann manifold, without the problem of a “Coordinate Singularity” located at the Black Hole Event Horizon; and which satisfies the “Geodesic Incompleteness” and “Null Geodesic Completeness” axioms. This work also describes conceptually the physics behind the Gaussian Distance Curvature and Reduction Density equation that Schwarzschild used to eliminate and avoid a “Coordinate Singularity”. This work reveals that Schwarzschild’s original 1916 solution, predicts that the Inertial Mass Volume Density is reduced at all points in the inhomogeneous gradient gravitational field. This reduced density predicted by Schwarzschild’s original 1916 solution, also reduces the gravitational tangential velocity, and gravitational acceleration throughout the entirety of the inhomogeneous gradient gravitational field. The “Coordinate Singularity” is an anomaly that is predicted by the modern literature, at the surface of the Black Hole Event Horizon, and is an infinitely large value, ( ), with “extreme curvature” of the geodesic as the radius approaches Schwarzschild Radius ( ). This value is an anomaly, and is not a natural artifact for any Non-Euclidean metric. Next, let’s consider Karl Schwarzschild’s original 1916 metric solution for the Non-Euclidean Spherically SymmetricMetric ( ) equation. In Karl Schwarzschild’s original paper in (1916), he does not have two (2) “Singularities” in his original Metric ( ) equation; like that which is described in “modern literature” claims. Schwarzschild, has only the one “Physical Singularity” located at zero radius ( ) of the gravitational field; described in his original solution 1916. I believe that this one “Physical Singularity” result is a natural artifact of the “Non-Euclidean” geometry, which is not a feature of the “Euclidean” geometry. The original form of the Schwarzschild Metric ( ) equation, as presented by Schwarzschild in 1916; below with a metric signature of (-+++). The Schwarzschild Metric ( ) radial limits which extend from the center of the gradient gravitational field ( ), and into infinite ( ) distances, is given below. The radial distance given in Schwarzschild’s original form, is given by the Gaussian Curvature Radius given by the symbol ( ) and not the Semi-Major Radius given by the symbol ( ); which describes a radial distance relative to the center of the gradient gravitational field. Karl Schwarzschild in his paper claimed that this Gaussian curvature distance ( ), is not an actual physical measureable distance, but is an artifact of mathematics of the geodesics paths in Non-Euclidean curvature and geometry. It is a very notable difference in the way that modern mainstream literature presents the Schwarzschild Spherically Symmetric Metric and the way the Karl Schwarzschild presented his original solution in 1916. Using the distance ( ) of Gaussian curvature, given in Schwarzschild’s original work, eliminates the “Coordinate Singularity” at the Black Hole Event Horizon. The main difference is that the modern mainstream physics literature claims that there is a “Coordinate Singularity” located at the surface of the Black Hole Event Horizon. And because of this “Coordinate Singularity” space and time become unpredictable at the Black Hole Event Horizon. 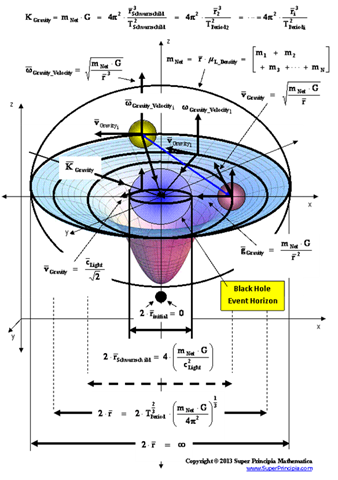 In Karl Schwarzschild original 1916 metric solution, there is not a “Coordinate Singularity” located at the surface of the Black Hole Event Horizon; but there is a quantitative value for space, distance, and time, is measured at the Black Hole Event Horizon. Next it will be presented, a new form of Schwarzschild’s original 1916 metric coordinate solution, and metric equation. Starting with Schwarzschild Gaussian Curvature Distance ( ) – in “Original 1916 Form”, from the equation above, and taking the differential yields the following. Next, substituting the above differential equation into the original form of the Schwarzschild Spherically Symmetric Metric ( ) differential equation, as presented by Schwarzschild in 1916. This will be done, so that the Schwarzschild original 1916 metric, is in a form that is similar to the modern literature form of the metric as shown below. The above equation is a new mathematical representation of the Karl Schwarzschild’s original 1916 solution; with a metric signature of (-+++) being used. This result presented in Schwarzschild’s original paper predicts that the Schwarzschild Metric ( ) should only have “One (1) Physical Singularity” in the metric located at the center of the gravitational field ( ). Whereas, the modern literature which describes the Schwarzschild Metric in their writings, claims that there is a second “Coordinate Singularity” at the Black Hole Event Horizon ( ). 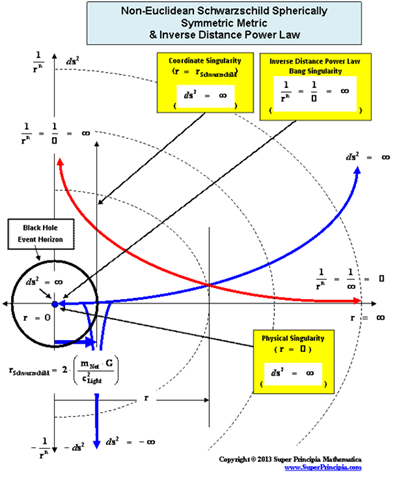 It is obvious from the above equation, that Karl Schwarzschild’s original 1916 solution does not produce a “Coordinate Singularity” at the Black Hole Event Horizon ( ). Therefore using Schwarzschild’s original 1916 solution, the “Coordinate Singularity” anomaly, located at the Black Hole Event Horizon and Schwarzschild Radius ( ), as predicted by modern literature is eliminated; as demonstrated in the chart and graphically below. Once again, in Schwarzschild’s original solution, there is only one “Physical Singularity” located at zero radius ( ) of the gravitational field. 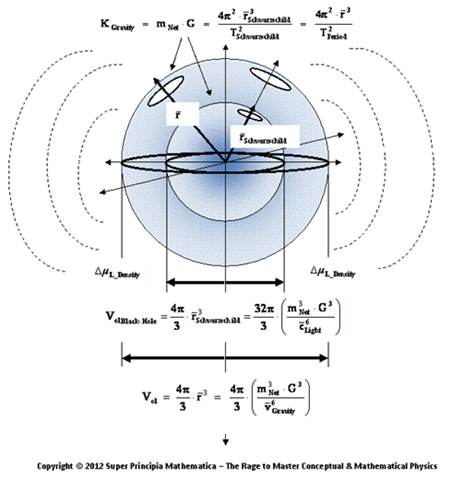 The Schwarzschild Spherically Symmetric Metric ( ) therefore predicts the following. The Schwarzschild Original 1916 Metric ( ) predicts the “Physical Singularity” located at zero radius, is “extreme curvature” as the geodesic approaches an infinitely large value, ( ), as the radius approaches zero ( ). The “Physical Singularity” is a natural artifact for any Non-Euclidean metric. Therefore using Schwarzschild’s original 1916 solution, the“Coordinate Singularity” is eliminated where the radius is equal to the Schwarzschild Radius ( ); and a quantitative value for space, distance, and time, is measured at the Black Hole Event Horizon. 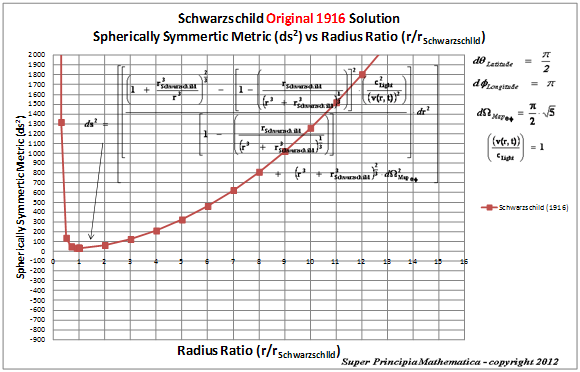 The Schwarzschild Spherically Symmetric Original 1916 Metric ( ), compared to the modern literature Schwarzschild Spherically Symmetric Metric ( ), is shown in graph below. The Schwarzschild Spherically Symmetric Original 1916 Metric ( ), eliminates the “Coordinate Singularity” located at the Black Hole Event Horizon ( ), as compared to the modern literature Schwarzschild Spherically Symmetric Metric ( ). This mathematical form, presented in Schwarzschild’s original 1916 paper where he gives a “One (1) Singularity” solution, is much different from what is currently written, accepted, and taught in literature with the “Two (2) Singularities” solution. In the author’s opinion, the original solution proposed by Karl Schwarzschild’s original paper in 1916, solves the “Coordinate Singularity” anomaly at the Black Hole Event Horizon, but is not an accurate description of nature. In the author’s opinion, the most accurate “Non-Euclidean” geometric metric description, of the contracting and curving of space, space-time, or a gravitational field in the presence of mater, would behave Euclidean as the radius approaches zero ( ). 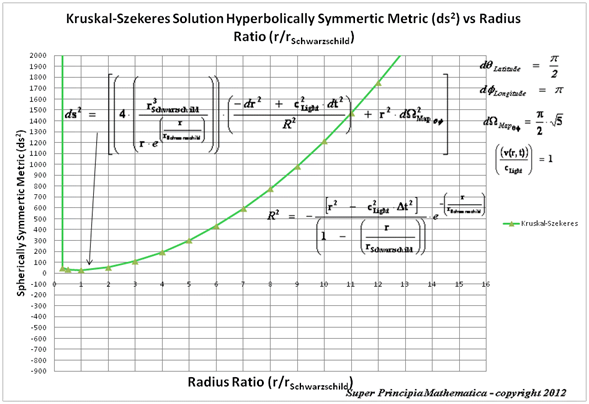 In Karl Schwarzschild’s original 1916 solution, as the spherically symmetric radius approaches zero ( ), the metric is approaching an infinitely large number ( ), when it should be approaching an infinitely small number ( ). It is assumed by many, who read literature on the original works of Schwarzschild, that the Gaussian Curvature Distance ( ), as given by Schwarzschild original 1916 solution, describes as a radial distance, which originates from a source at the center of the gravitational field; it does not! The Gaussian Curvature Distance ( ) is not true radial distance, but is related to the Gaussian curvature and density ( ) of a spherically symmetric geodesic surface, in a localized region of gradient gravitational field, related to the inertial mass volume density ( ) of the gradient gravitational field, and the Black Hole Event Horizon inertial mass volume density ( ); of the space, space-time, or a gravitational field. Therefore Schwarzschild’s original 1916 solution predicts that the Gaussian Curvature Density ( ) is a reduced Inertial Mass Volume Density ( ), spread throughout the entirety of the inhomogeneous gradient gravitational field, surrounding a Net Inertial Mass ( ), or energy source; given by the following. Now let’s look at the Gaussian Curvature Distance ( ) predicted bySchwarzschild in his “Original 1916 paper. I will extend this concept to fit the concept of a Reduced Volume Mass Density and the Kepler’s Laws of Motion. This is not a concept that Karl Schwarzschild investigated, but here you will see that this concept can be extended in the following. The Net Inertial “Volume” Mass Density( ), of the “Black Hole Event Horizon” is a fixed local constant value, of the “inhomogeneous” gradient gravitational field, and is defined as the Net Inertial Mass ( ), divided by the “Black Hole Event Horizon” Volume( ) of the gradient gravitational field. 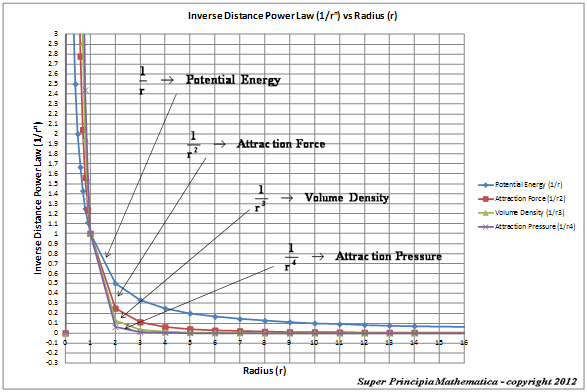 The Net Inertial “Volume” Mass Density( ), of the “Inhomogeneous” gradient gravitational field, is defined as the Net Inertial Mass ( ), divided by an infinite series of Spherical Volume ( ), of gradient energy potentials of the inhomogeneous gradient gravitational field. The Gaussian “Non-Euclidean” Curvature Density ( ), predicted by Schwarzschild Gaussian curvature ( ) results in mass curving or warping space, predicts that at any location in the space, space-time, or gradient gravitational field, the mass density of that gradient is slightly “less dense” than would be, the normal mass volume density at that location ( ). The Gaussian Squared Velocity Inertial Potential ( ), is predicted when the Schwarzschild Gaussian curvature distance ( ) in a Non-Euclidean space, as a result of mass curving or warping space, predicts that at any location in the space, space-time, or gradient gravitational field, the squared velocity inertia of that gradient gravity field is slightly “smaller” or “slower” than would be, the normal Gravitational Tangential Squared Velocity Inertia of the gravitational field ( ) in that location. Now, let’s consider Kepler’s Third Law, in consideration with the Schwarzschild Gaussian Curvature distance ( ). Now, let’s consider Kepler’s Third Law, and rewrite the Schwarzschild Gaussian Curvature distance ( ) to show that it describes the volume of space, space-time, or gravitational field, due to the presence of mass with a black hole event horizon at the center of the gravitational field. The above “Gaussian Total Volume” ( ) equation means that due to the presence of mass, with a black hole event horizon at the center of a gradient gravitational field, the total volume is the net sum of the volume ( ) of any one of the infinite shells of the spherical gradient gravitational field, and sum the gravitational field Black Hole Event Horizon Volume ( ). 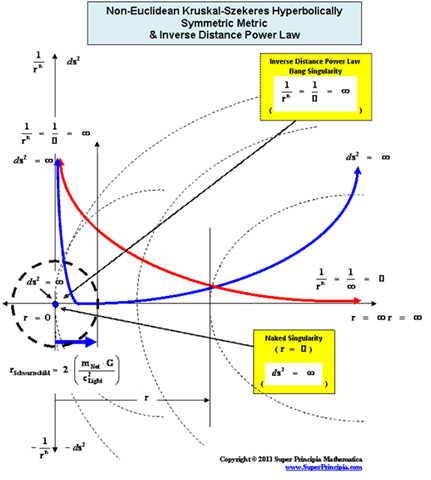 Next, from the equation above, we derive, a “Gaussian Angular Velocity” which describes that the gravitational angular velocity in a gravitational field potential, is “slightly” reduced or “slowed down” in rate or motion, due to the Non-Euclidean curved, space, space-time, or gravitational field. Likewise, using the Schwarzschild Gaussian Curvature distance ( ) equation, we derive, a “Gaussian Gravitational Field Attraction Acceleration” ( ) which describes that the gravitational field attraction acceleration in a gravitational field potential, is “slightly” reduced in the attraction rate, due to the Non-Euclidean curved, space, space-time, or gravitational field. The above spherically symmetric “Non-Euclidean” inhomogeneous, gradient gravitational field, space, or space-time equations are the result of using the original solution of the Schwarzschild Gaussian Curvature distance ( ) predicted in 1916. The mainstream physics community at large currently teaches that there is no solution to the “Coordinate Singularity” anomaly of the Schwarzschild Spherically Symmetric Metric, located at the Black Hole Event Horizon and does not appear to be searching for a solution! The mainstream physics community seems to be content, accepting the fact that, space and time, become unpredictable at the Black Hole Event Horizon; although the inventor of the metric Schwarzschild, never described unpredictability at the Black Hole Event Horizon surface. Published in Schwarzschild’s original 1916 metric solution, there is not a “Coordinate Singularity” located at the Black Hole Event Horizon, but there is an actual quantitative value for space and time, that is predicted there. 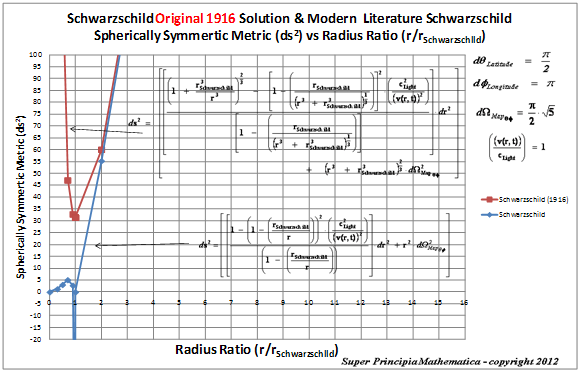 This paper and work compared the Schwarzschild Spherically Symmetric Metric equation original 1916 results with the results predicted by the modern literature on the Schwarzschild Metric. This work proved that eliminating by the “Coordinate Singularity” anomaly this allows for smooth prediction of a maximally extended “geodesic” world “line element” ( ), which describes a real curving or warping of physical space, space-time, or a gradient gravitational field, that is spherically symmetric, surrounding a condensed matter, mass ( ), or energy source, even at the Black Hole Event Horizon. This work demonstrated that the Schwarzschild original 1916, metric equation and coordinates are a good choice for a metric system, because, they are able to cover the entire extended Schwarzschild manifold, without the problem of a “Coordinate Singularity” located at the Black Hole Event Horizon. This work also described conceptually the physics behind the Gaussian Distance Curvature and Reduction Density equation that Schwarzschild used to eliminate and avoid a “Coordinate Singularity”. This work revealed that Schwarzschild’s original 1916 metric solution, predicts that the Inertial Mass Volume Density is reduced at all points in the inhomogeneous gradient gravitational field. This reduced density predicted by Schwarzschild’s original 1916 solution, also reduces the gravitational tangential velocity, and acceleration throughout the entirety of the inhomogeneous gradient gravitational field. The author does not agree that these gravitational field relations predicted by Schwarzschild Gaussian Curvature distance ( ) predicted in 1916, are actual physical results. The predictions made by these gravitational field relations would have to be measured, to be validated. I only did the physics here, to show that Karl Schwarzschild’s original solution is not trivial, but yields some interesting physics. And so that the physics community will stop propagating the invalid physics that a “Coordinate Singularity”, located at the Black Hole Event Horizon, has to be true in nature. When in fact, the “Coordinate Singularity”, is a mathematical anomaly, which can be resolved with proper mathematical treatment. 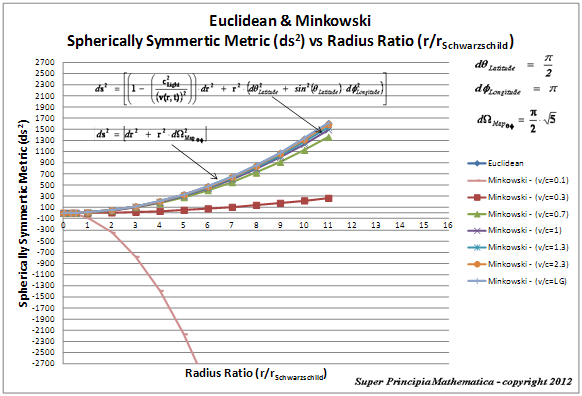 It turns out that there can be many different solutions and mathematical forms for describing the radial distance ( ) as measured from the center of the gradient gravitational field, of a Spherically Symmetric Schwarzschild “Non-Euclidean” Metric. The original form of the Schwarzschild Metric ( ) equation, as presented by Schwarzschild in 1916; below. In the author’s opinion, the most accurate “Non-Euclidean” geometric metric description, of the contracting and curving of space, space-time, or a gravitational field in the presence of condensed mass, matter or energy, would behave Euclidean, as the radius approaches zero ( ), the metric should be approaching an infinitely small number ( )! 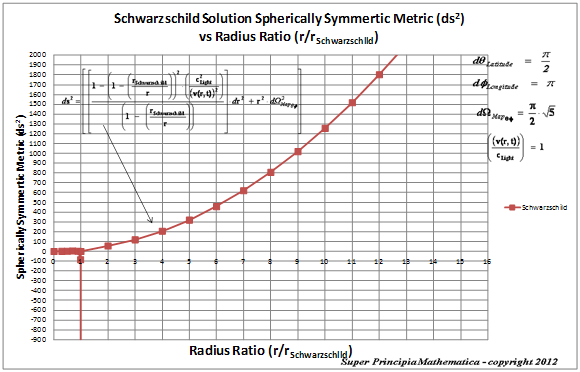 In Karl Schwarzschild’s original 1916 solution, as the spherically symmetric radius approaches zero ( ), the metric is approaching an infinitely large number ( ), when it should be approaching an infinitely small number ( )! This paper eliminates the need for all of the weird physics that is predicted by current mainstream physics, that takes place at the surface of Black Hole Event Horizon, such as light not being able to escape the black hole, time becoming infinite, and spaghettification of anyone crossing the event horizon; all of these concepts are eliminated using the Schwarzschild Gaussian Curvature distance ( ) employed by Karl Schwarzschild’s original 1916 metric solution.